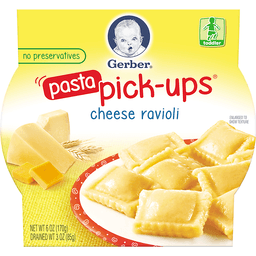 Gerber® Pasta Pick-Ups® Cheese Ravioli. No Preservatives. Toddler. Net Wt 6 Oz (170 g). Drained Wt 3 Oz (85 g). Pasta pickups* are just the right size for toddlers learning to pick up their food! Easy to self-feed tray. Wide tray opening makes it easy to pick up pieces. Designed to be stable on the table. Tray not made with BPA. Nestle® Good Food, Good Life. Nutritional Compass®. All trademarks are owned by Societe des Produits Nestle S.A., Vevey, Switzerland. We are awake when you are! 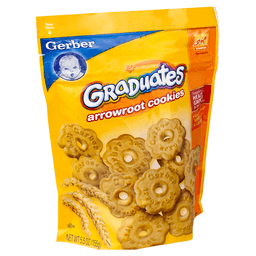 Call us 24/7: 1-800-4-GERBER. 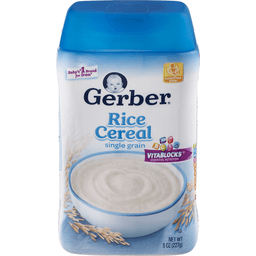 En espanol: 1-800-511-6862. gerber.com. © 2015 Nestle. Made with natural ingredients. Full serving of fruit. Real food means no artificial flavors or colors - just delicious and nutritious goodness. Full serving of fruit. Made with natural ingredients. Gluten free. BPA-free packaging. Facebook. Twitter. Pinterest. 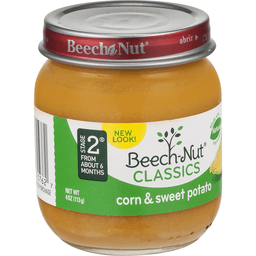 Learn More About Our Products: 1-800-Beech-Nut. 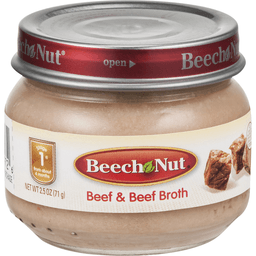 www.beechnut.com. Product of Chile. Naturally flavored with other natural flavors. No preservatives, artificial flavors or artificial sweeteners! Pasteurized after culturing. Nutritional Compass: Nestle - Good food, good life. 2 g whole grain per serving from brown rice and quinoa. We're awake when you are! 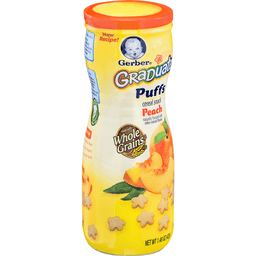 Call us 24/7: 1-800-4-Gerber. 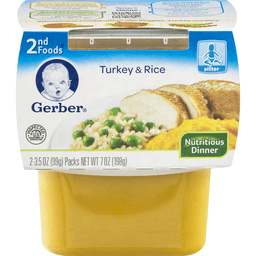 gerber.com. 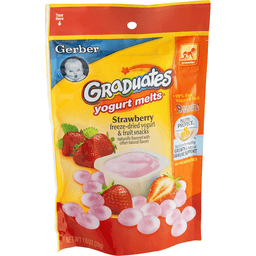 Made with low fat yogurt. No preservatives, artificial flavors or artificial sweeteners. Why our Yogurt Blends don't need the fridge! 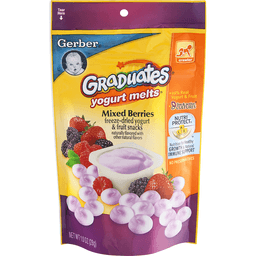 We start with fresh yogurt & real fruit + gently cook for 15 seconds + Safely seal it with love = for a taste babies love with no preservatives. Taste they love, nutrition you love! - Score: Made with low fat yogurt & real fruit; A good source of calcium & vitamin D for healthy bone development; Milk ingredients produced without the use of added rBST growth hormones (No significant difference has been shown milk derived from rBST treated and non-rBST treated cows). Grade A.
Sitter. Juice & fruit blend. 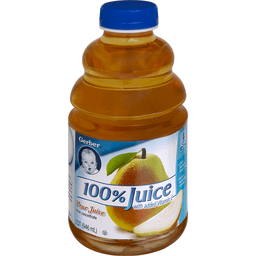 Made with natural juice & fruit. We're awake when you are! 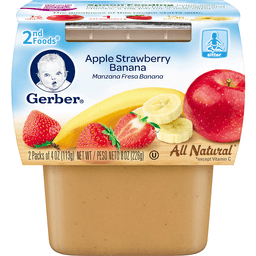 Call Us 24/7: 1-800-4-Gerber; gerber.com. Learn more. 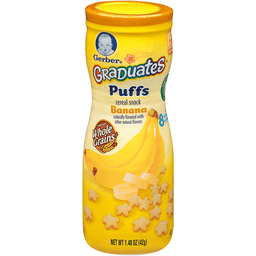 Delicious pineapple juice and bananas help make this a nutritious snack your baby will love. 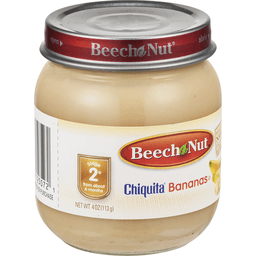 This recipe is made with your baby in mind and includes: 1/8 banana; 2 tsp cooked rice in each tub. 100% recycled paperboard. Unsalted, no added starch, artificial flavors or colors. Individual units not labeled for retail sale. Sitter. Visit MyGerber.com & meet Dorothy, 1-800-4-Gerber. Spanish: 1-800-511-6862. No artificial flavors. Packaging made with no BPA. Made with the goodness of: 3-1/2 tbsp vegetables; 2 tbsp cooked Pasta & rice; 2 tbsp cheese in each tub. Made with real cheddar cheese. Inner units not labeled for retail sale. Simple dinners. From about 6 months. No artificial ingredients, minimally processed. No artificial colors, flavors or preservatives. Naturally flavored with other natural flavors. No preservatives, artificial flavors or artificial sweeteners! Pasteurized after culturing. Nutritional Compass: Nestle - Good food, good life. We're awake when you are! 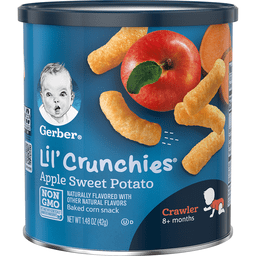 Call us 24/7: 1-800-4-Gerber. 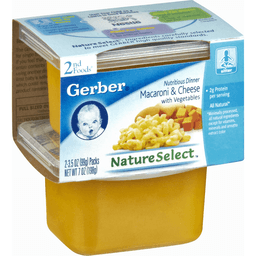 gerber.com. 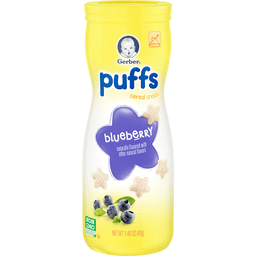 A creamy texture and a delicious taste that babies love. Why our Yogurt Blends don't need the fridge! 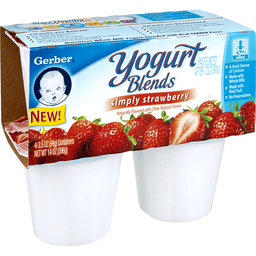 We start with fresh yogurt & real fruit + gently cook for 15 seconds + Safely seal it with love = for a taste babies love with no preservatives. Grade A. 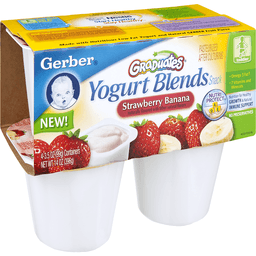 A perfect way to introduce your baby to yogurt because: Made with whole milk yogurt for a good source of protein for healthy growth; An excellent source of calcium and good source of vitamin D for healthy bone development; Milk ingredients produced without the use of added rBST growth hormones (No significant difference has been shown milk derived from rBST treated and non-rBST treated cows). 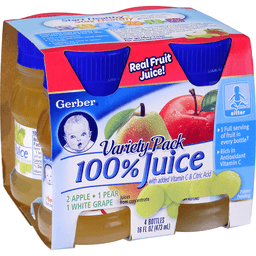 Gerber Pure™ Purified Water. With Minerals Added for Taste. Preparing Infant Formula*. Mixing with Cereal. Birth+. Clean Water, Pure & Simple. Made for Mixing. 0 mg sodium. No added fluoride**. Undergoes an extensive multi-step process to ensure consistent purity and quality*. Purified using reverse osmosis or distillation. Please recycle. 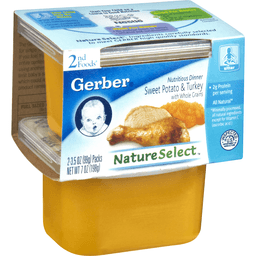 **Go to www.gerber.com for more information. Source: Deep protected well, Breinigsiville, PA and/or public water supply, Allentown, PA. All trademarks are owned by Societe des Produits Nestle S.A., Vevey, Switzerland. 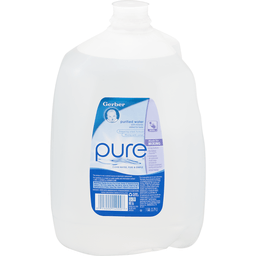 Gerber Pure™ water bottled specifically for Gerber Products Company, Florham Park, NJ, by Nestle Waters North America Inc., Breinigsville, PA. 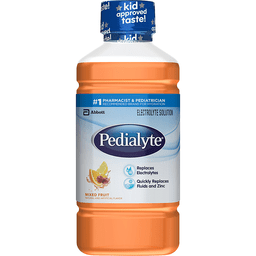 This product is not a nutrient source or electrolyte replacement. For questions or a report on water quality and information contact 1-800-4-GERBER or gerber.com. ©2011. Sitter. Non GMO. Not made with genetically engineered ingredients. Visit MyGerber.com & meet Dorothy, 1-800-4-Gerber. Spanish: 1-800-511-6862. No artificial flavors or colors. Packaging made with no BPA. 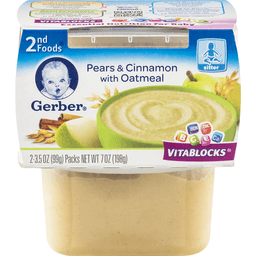 The goodness inside includes: 1/3 pear; 3 tbsp cooked oats in each tub. Iron to help support learning ability. Inner units not labeled for retail sale. 100% natural. Non GMO Project verified. nongmoproject.org. 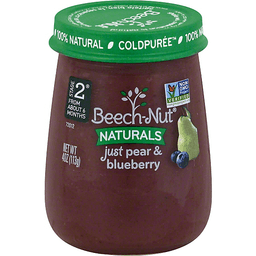 Contact us at 1-800-Beech-Nut or www.beechnut.com. Sitter. Smart flow. Non GMO Project verified. nongmoproject.org. USDA organic. 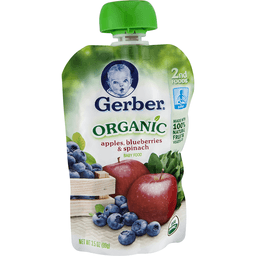 It's not just organic, it's Gerber. We work with US farmers like Campbell Orchards in Yakima, WA, who grow our organic apples with love and care. Smart Flow Spout: flow control means more on your little one's spoon, less everywhere else. No added starch; unsalted. No artificial flavors or colors. Made with 1/2 apple, 1/2 spinach leaf, 16 blueberries. We're awake when you are! 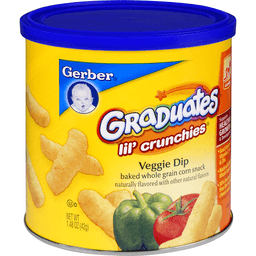 Call Us 24/7: 1-800-4-gerber. 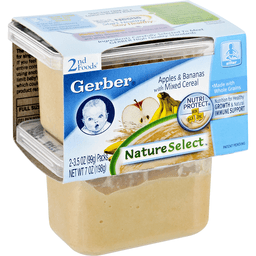 gerber.com. Certified organic by Oregon Tilth. Learning to use a spoon. Nutritional Compass: Nestle - Good food, good life. 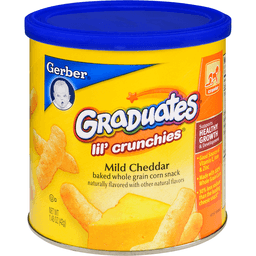 Good Question: What makes Gerber Graduates Lil' Meals selections perfect for Toddlers? Good to know: 5 g of protein (24% of daily value); 20% DV of calcium. 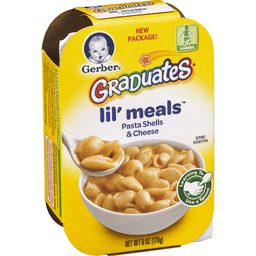 Good to Remember: Graduates Lil' Meals selections are just right for spooning. Self-feed tray made without the use of BPA. Easy to self-feed tray. Good to Connect: Scan the code to learn more about toddler nutrition. Nutrition Expects available 24/7. facebook.com/gerber. 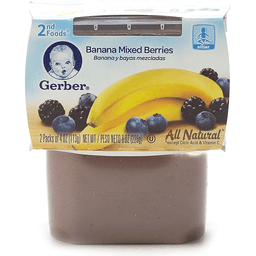 gerber.com. 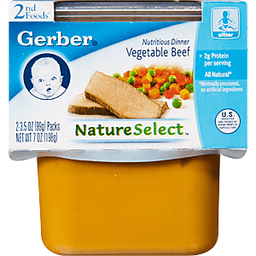 1-800-4-gerber. Your child may be ready if she or he: stand alone and begins to walk alone. Feeds self easily with fingers. Bites through a variety of textures. Recipes are carefully prepared for your toddler with no preservatives and here's how we do it. Prior to cooking, we remove most of the air and seal the package. The food is then pressure-cooked so no preservatives are needed. 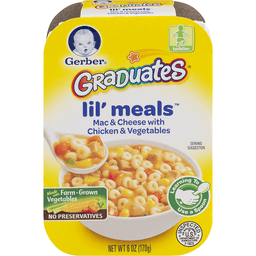 Our recipes are ready to eat with 100% Gerber Graduates Goodness inside. Just right for spooning. 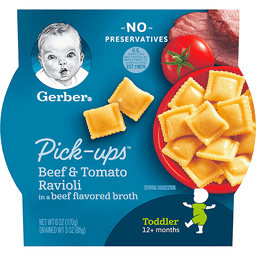 Gerber® Toddler Beef & Tomato Ravioli Pasta Pick-Ups®. No preservatives. Packed in beef flavored broth. U.S. inspected and passed by department of agriculture EST. 19076. Good food, good life. Nestle®. Pasta pickups® are just the right size for toddlers learning to pick up their food! No preservatives. Tray not made with BPA. Nutritional Compass®. Easy to self - feed tray. Wide tray opening makes it easy to pick up pieces. Designed to be stable on the table. Scan the code to learn more about toddler nutrition. We're awake when you are! 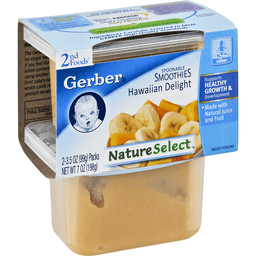 Call us 24/7: 1-800-4-GERBER. 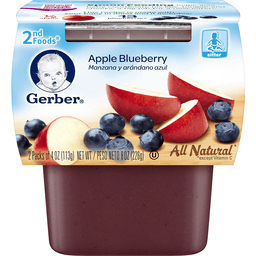 En espanol: 1-800-511-6862. gerber.com. All trademarks are owned by Societe des Produits Nestle S.A., Vevey, Switzerland. ©2015 Nestle. Supported sitter. All natural (except vitamin C). Good food, good life. Good to Remember: It may take up to 10 tries before your baby accepts a new food. Package made without the use of BPA. 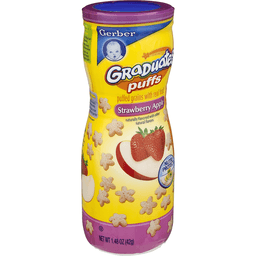 Good Question: Why are Gerber 1st Foods Purees an important part of baby's nutrition journey? 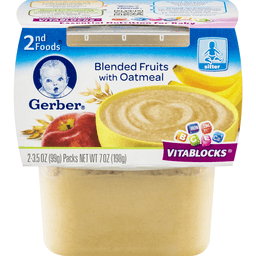 Good to Know: Texture just right for babies starting solids. Single variety vegetable is ideal to introduce new tastes and check for sensitivities. Good to Connect: Nutrition experts available 24/7. facebook.com/gerber. 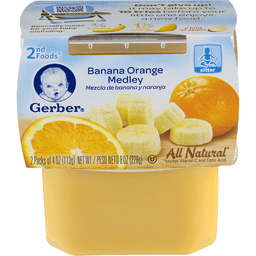 gerber.com. 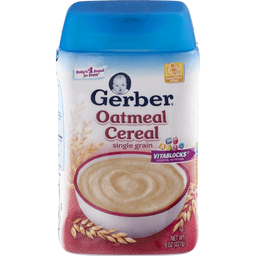 1-800-4-GERBER. Nutritional Compass. 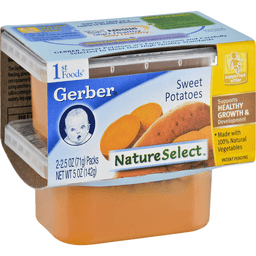 Gerber Sweet Potatoes help baby discover the taste of natural vegetables to encourage healthy eating habits. Unsalted, no artificial flavors or colors. 100% recycled paperboard. Non GMO Project verified. nongmoproject.org. 100% natural. 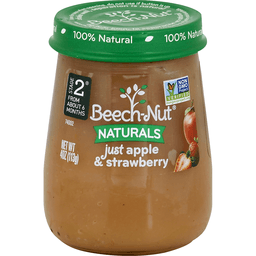 Contact us at 1-800-Beech-Nut or www.beechnut.com. Supported sitter. All natural. We're awake when you are! 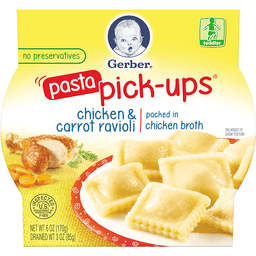 Call Us 24/7: 1-800-4-Gerber. 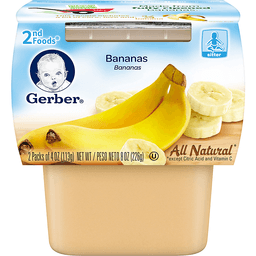 gerber.com. Spoon-feeding helps teach taking turns and strengthens your special bond with your baby. 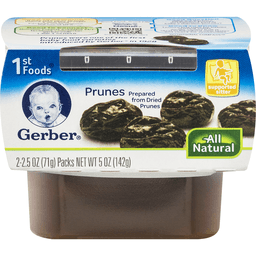 Specially made for your baby including: 2-3/4 prunes in each tub. 100% recycled paperboard. Unsweetened, no artificial flavors or colors. Not made with genetically modified ingredients. Individual units not labeled for retail sale. Prepared from dried prunes. 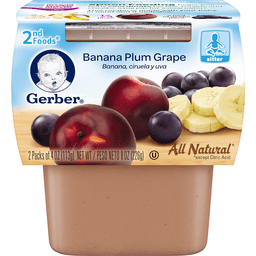 Gerber® Banana Plum Grape 2nd Foods®. Non GMO. Not made with genetically engineered ingredients. 2 pack of 4 oz (113g). Net wt 8 oz (226g). No artificial flavors or colors. 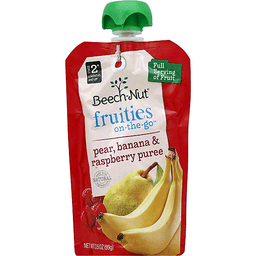 Packaging made with no BPA. The goodness inside: 2/3 banana. 1/3 plum. Hint of concord grape juice. Spoon feeding helps your baby coordinate his lips, tongue and cheeks, a big job for a new eater! Us only. Paper, sleeve. No multi--layer, no cup. how2recycle.info. All trademarks are owned by Nestle S.A., Vevey, Switzerland or used with permission. 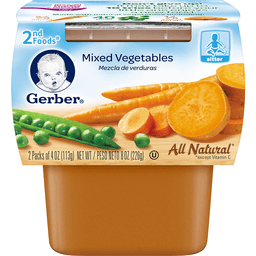 Baby foods may be served at room temperature or warmed. 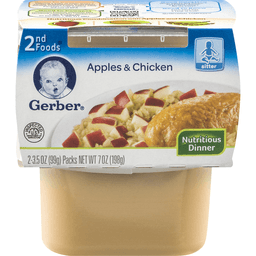 You can feed your baby directly from each convenient tub. 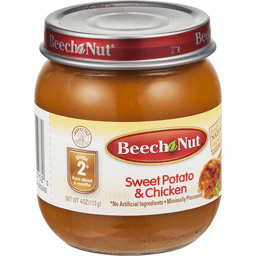 If one tub is too large for your baby, spoon out the desired portion into another dish for feeding and refrigerate the unused portion to enjoy later (within 2 days of opening). If you feed directly from the container, discard any unused portion. 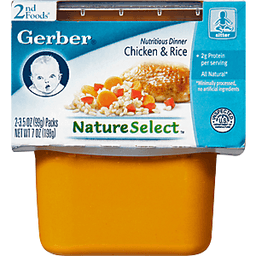 1-800-4-GERBER. Spanish: 1-800-511-6862. Visit mygerber.com & meet Dorothy ©2017 Nestle.